Nina of Shalom Mama discusses the healing properties of the herb Arnica. It is especially effective in treating bruises, and relieving pain quickly. This is a balm that should be in every Herbal First Aid Kit. Don’t use Arnica on broken skin (open cuts, abrasions). She goes on to say that she has used Arnica ointment on small scratches. I personally would adhere to the advice by many sources to only use Arnica topically for bumps and bruises. 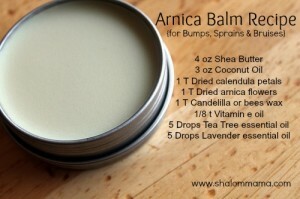 Nina also has a great recipe for Arnica balm. It uses Shea butter, Arnica, beeswax, coconut oil, essential oils and other herbs. Where Can I get quality Herbs and essential oils? Mountain Rose Herbs has high- quality herbs and essential oils.